We got to the hospital at 6 am for check in. 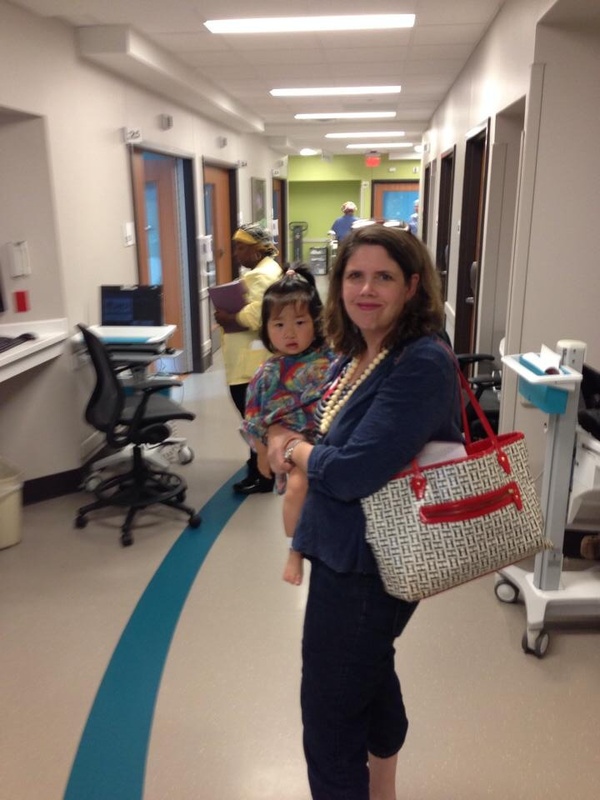 By 7:30 they were taking Maggie away for surgery, which was scheduled to begin at 7:45. 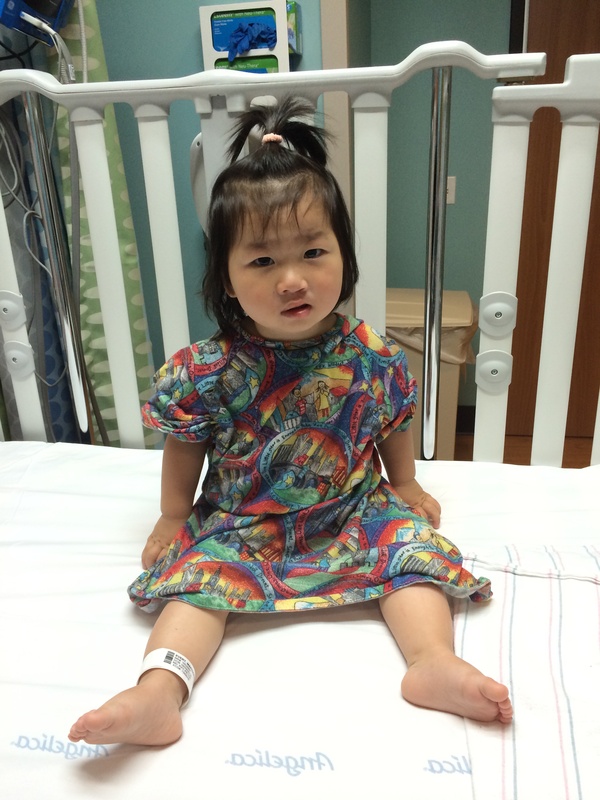 The first order of business was to replace her ear tubes as one was blocked and the other looked to be coming out. The ENT said cleft affected children on average will go through four sets of ear tubes. 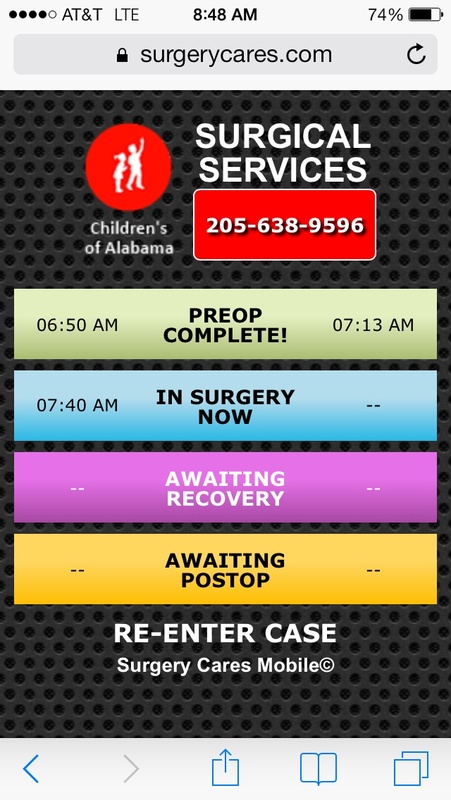 I love this app that UAB offers..
Once that was done Dr. Peter Ray began her palate repair. He finished faster than we expected, in about four hours. Dr. Ray felt good about how the repair went. 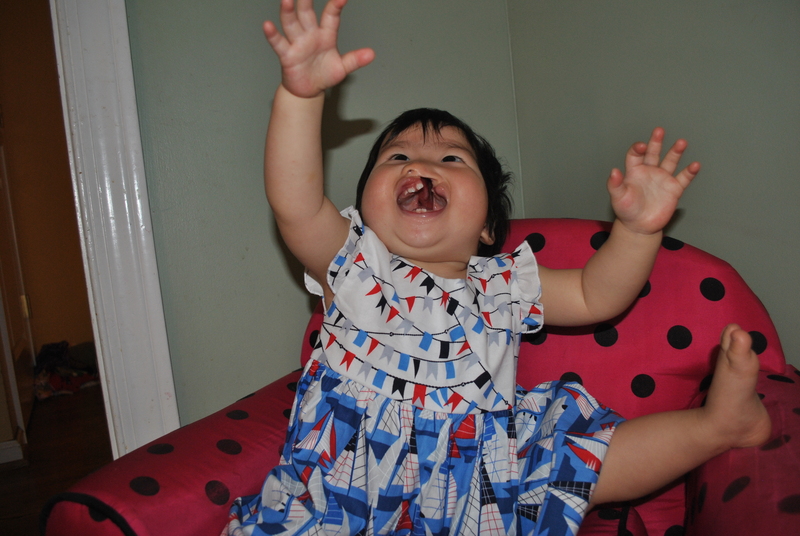 She is at greater risk for developing a fistula since her palate cleft was so wide–13 cm. This is still a matter for prayer. There was good news as well. 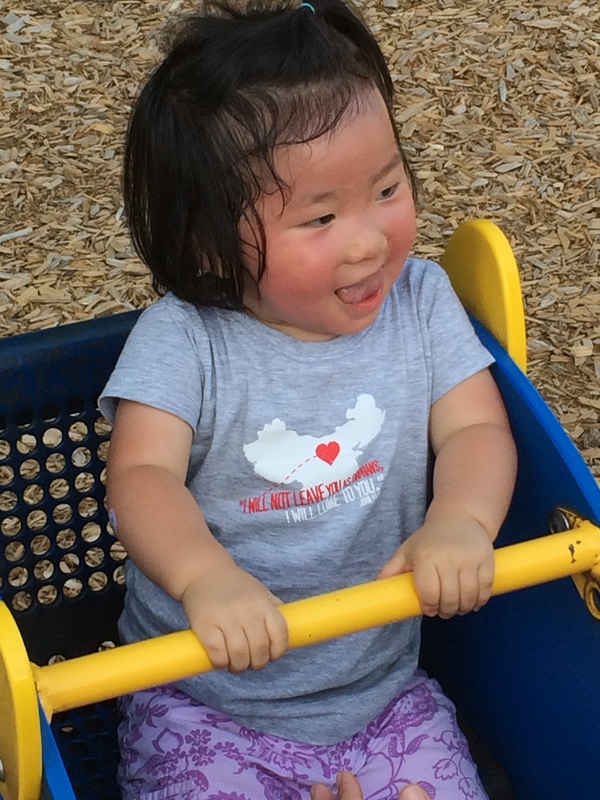 The depth of the cleft was only 8 cm from front to back, which is less than what Dr. Ray expected, and it is good news for her speech development going forward. Also, she has larger muscles in the roof of her mouth than they thought she would have, which gave them more to work with…that was a direct answer to prayer! A fellow cleft mama had told me they were praying the doctor would find more to work with than expected during surgery, so we began praying for the same thing–what a blessing and an encouragement to see this specific prayer answered! Notice she has a grape jelly packet in her hand–she would much rather hold that than any of the toys I brought. She was clutching a pat of butter in her other hand most of the evening, lol! Maggie did well her first night. She drank a bottle of juice and even ate a good dinner, which was surprising. The surgeon said it is rare for kids to eat the first night after surgery, but Maggie is a tough cookie and she never misses a meal if she can help it! She was pretty weepy and fussy, though, which was to be expected. The doctor said it would likely be a hard night for her, but it wasn’t too bad. She slept through the night, waking only when it was time for more medicine (every 3 hours) or whenever the night nurse came in to fiddle with her IV line, take vitals, etc. (which happened far too many times, in my opinion!). We took her arm splints off for one minute to change her clothes and her hands went right to her mouth. 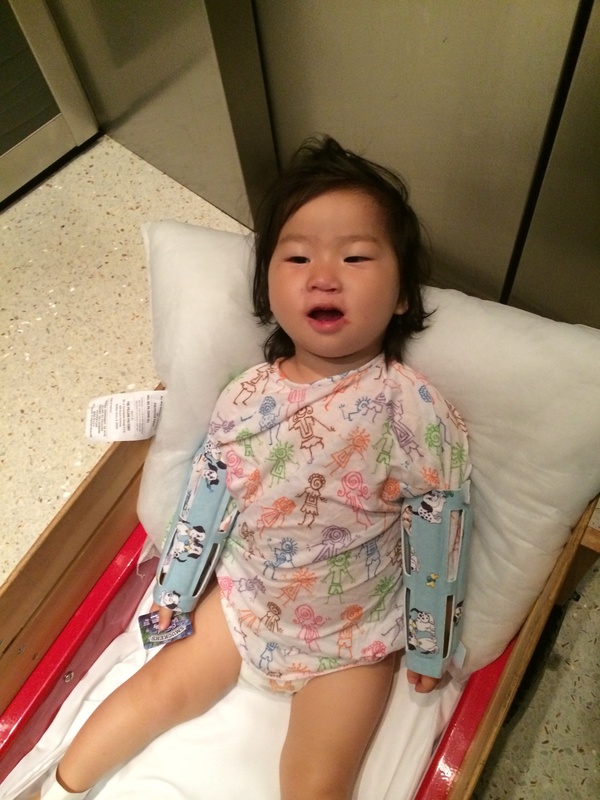 The doctor would like her to wear then 24/7 for 3 weeks if she can tolerate it. 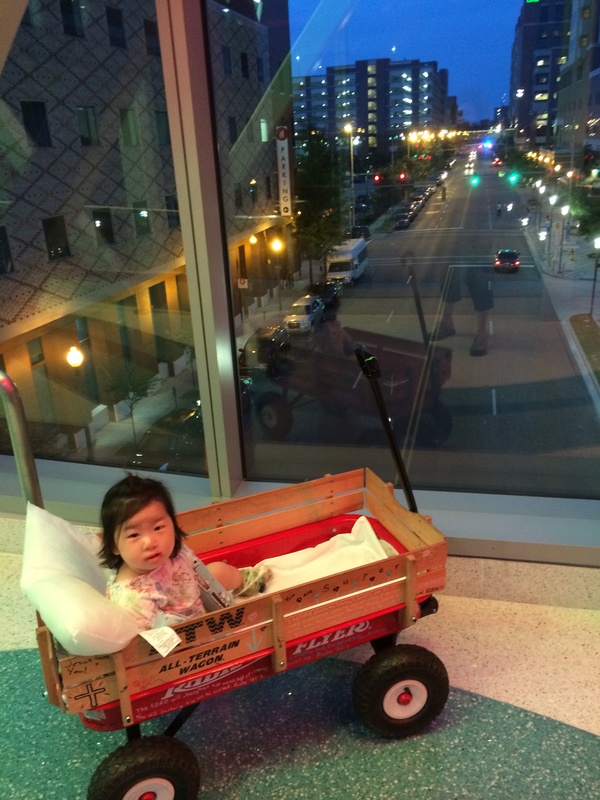 Maggie found her nightly wagon rides very relaxing. She did not want to drink her bottle the next morning but she was hungry. Breakfast was late in arriving so I gave her some chocolate pudding. It was a revelation to her! I do not usually give her chocolate as it makes her drool and it’s messy, but that was all I had at the moment so she loved her “breakfast of champions”. Later, when breakfast did arrive, she ate that, too. She was starving! 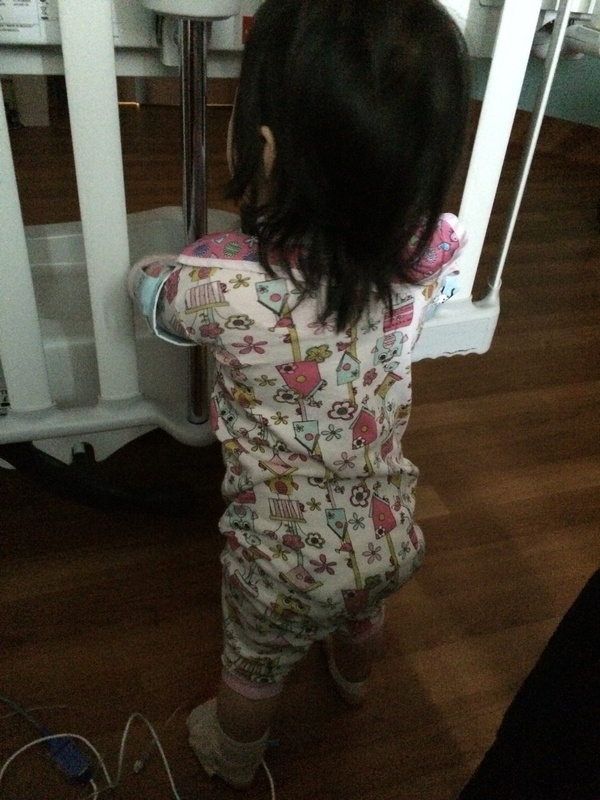 The IV line kept her close to the crib but she still wanted to pull up to stand. Day two was pretty challenging. Maggie was totally bored and ready to bust out of the hospital, but she still wasn’t doing well enough to come home. She got off the morphine but was still in pain, and still refusing to drink. There was a nice playroom on the floor where Maggie stayed. She enjoyed it! She was allowed off her IV a couple times for play breaks and that really helped. Ultimately she was released on Thursday, two days post-op. She is managing her pain but still not drinking. The doctor said some kids can go weeks without drinking–as long as she is eating a good pureed diet she will get enough fluid. 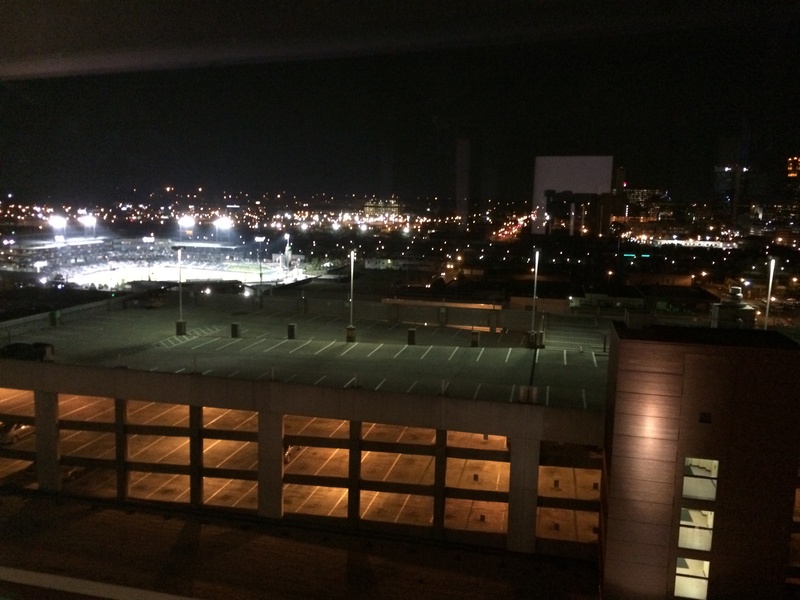 We had a great view from our window and we enjoyed sitting in the sill, watching the lights and a minor league ball game each night. That makes this mama a little nervous, but so far so good. She still has tears, still pinks up when squeezed, and still has wet diapers. They say her drinking will come back like flipping a switch whenever she is ready, and that with this surgery it is much easier to eat than it is to drink. I can get her to “drink” a little bit from a spoon, but not much. She will also let me squirt a few swallows of juice into her mouth from a juice box occasionally, but not often. We have tried syringes, straws, bottle, cup, etc. She just isn’t interested–it hurts! But she is chowing down on smoothie, yogurt, pudding, ice cream, jello, and baby food. And she is happy to be home! This girl likes to go, go, go and she has the roam of the place here. Thanks for your prayers. Please continue praying that she does not develop a fistula, that she will start drinking soon, that she can manage her pain, that she continues to sleep well at night (this was a HUGE issue after the last surgery and so far it is going great! ), and that she can tolerate her arm no-no’s. Maggie will be 20 months old on April 4th. 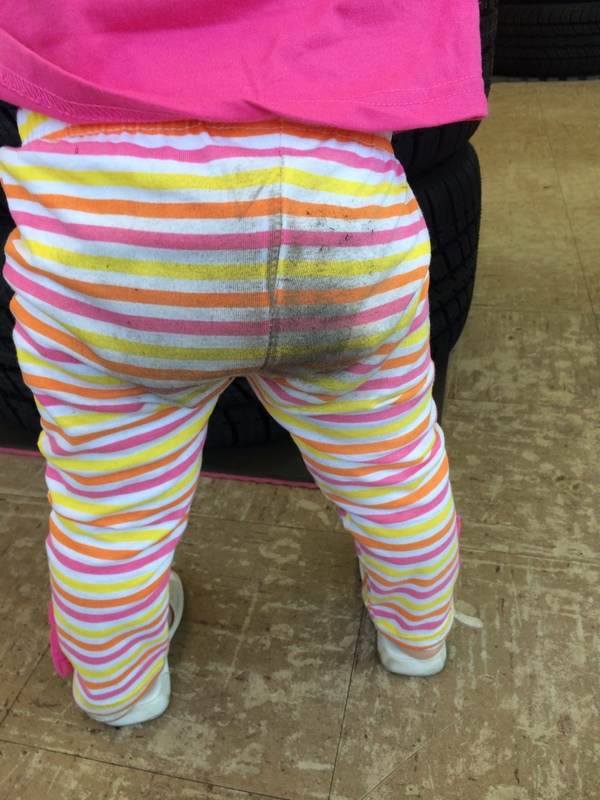 At her recent 18 month check up she was still quite delayed. This is to be expected–I recently spoke to one of Lifeline’s social workers and she said that a child adopted under the age of 2 years old will typically take 12 to 18 months to catch up. We have had Maggie home in the US for 6 months as of this week. 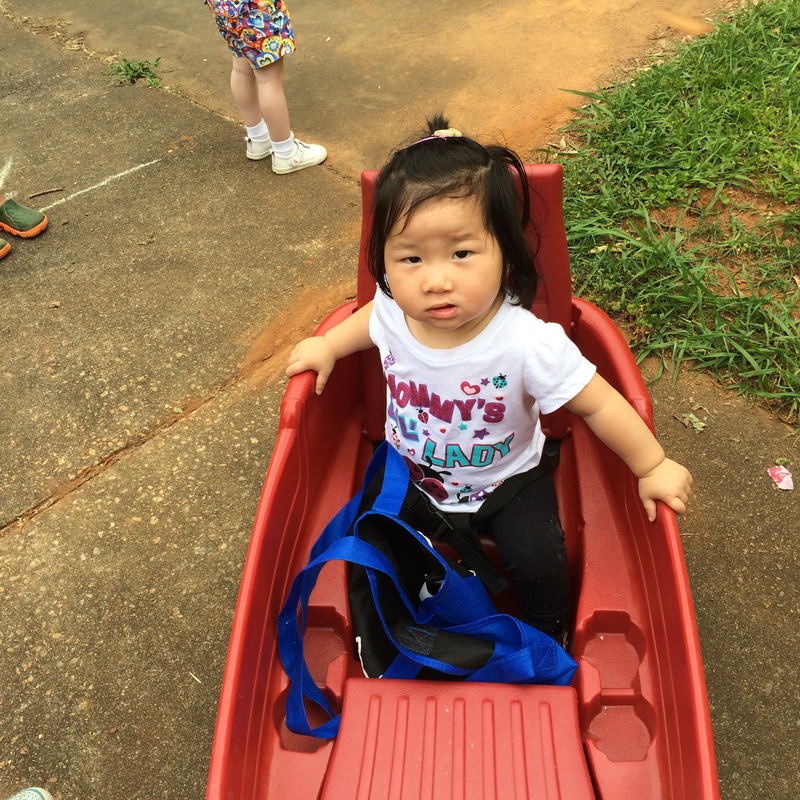 She enjoys riding in her wagon. 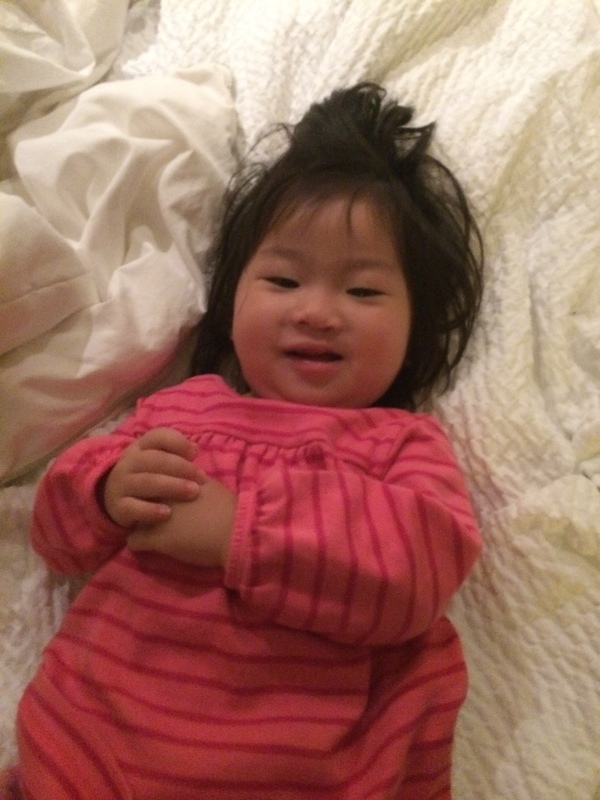 Her height and weight at her 18 month check up (2/21/14) was weight 23 lbs 13 oz., length 31″. Her growth over 4 1/2 months time was such: on October 1st at her first appointment she was almost 14 months old, weighed 18 lbs 10 oz and was in the 20th percentile for weight. Her height at that time was 28.5″ and she was in the 7th percentile for height. Her weight on 2/21/14 at 18 months was 23 lbs 13 oz, putting her in the 63rd percentile. 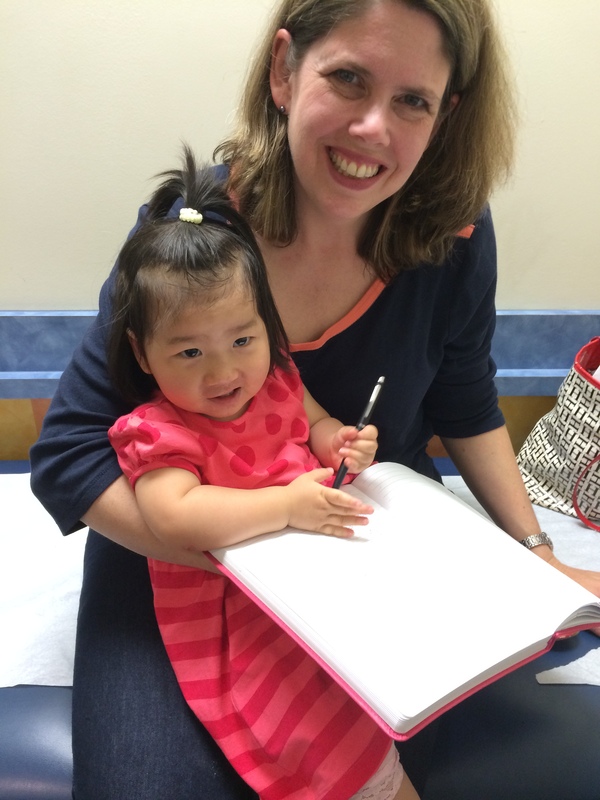 Her height at that appointment was 31″, putting her in the 22nd percentile. I asked the Dr. to give me a 12 month survey so I could see how she stacks up compared to typical 12 month old skills. As of today, here is where things stand: Communication: Maggie can play peekaboo, clap hands, do “so big” and wave bye bye on command (when she wants to). She can do this without being shown, just asked verbally–a 12 month old skill would be any one of these, and she can do them all. Maggie can follow one simple command such as “come here”, “give it to me” without me using gestures. If I ask “where is the ball (hat, shoe, etc. )” she looks at the object. 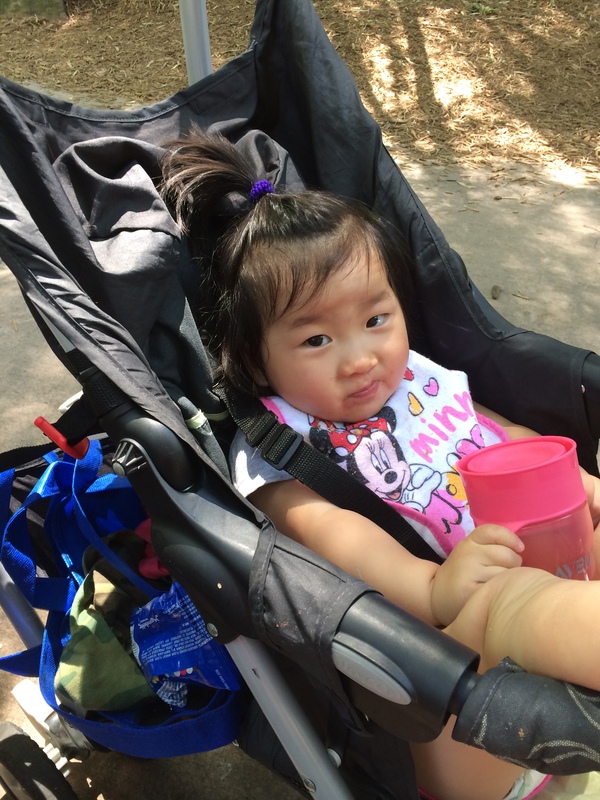 She recognizes and knows many objects–knowing one object is a 12 month skill. 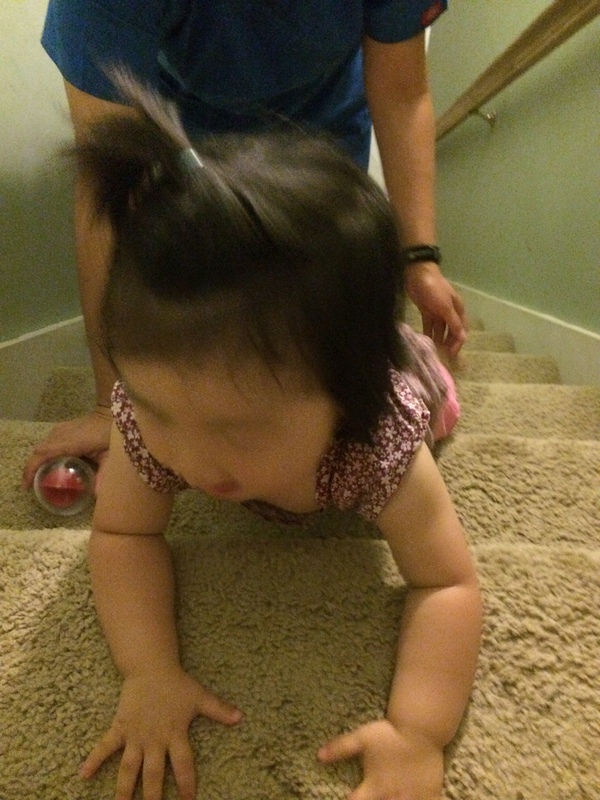 The stairs is the only place in our home that we can get her to crawl. It works! The PT wants her to practice on the stairs every day. She occasionally seems to say “mmmmm” for yummy but she doesn’t really seem to say “mama” any more–we thought she was saying that but she stopped. Once she said something that sounded like “uh oh” and once “hey”–but never repeated–so words/sounds are still only emerging. We aren’t getting any consistent words yet. She sometimes points when she wants something. She can indicate her desires, but pointing is an emerging skill. Usually she just holds her whole hand out instead of pointing one finger. She also sometimes shakes her head for no–not for Yes, though. 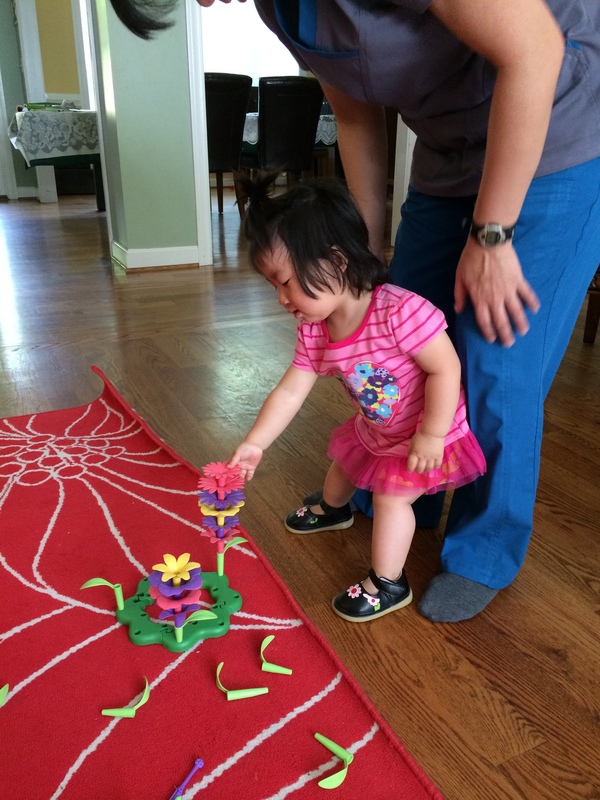 Gross Motor: Emerging Skills: While holding onto furniture she is starting to try and bend down to pick up a toy from the floor and return to standing. She also tries to lower herself with control (without falling) to sit. Both skills are emerging–she will hopefully be doing both within a week or so. 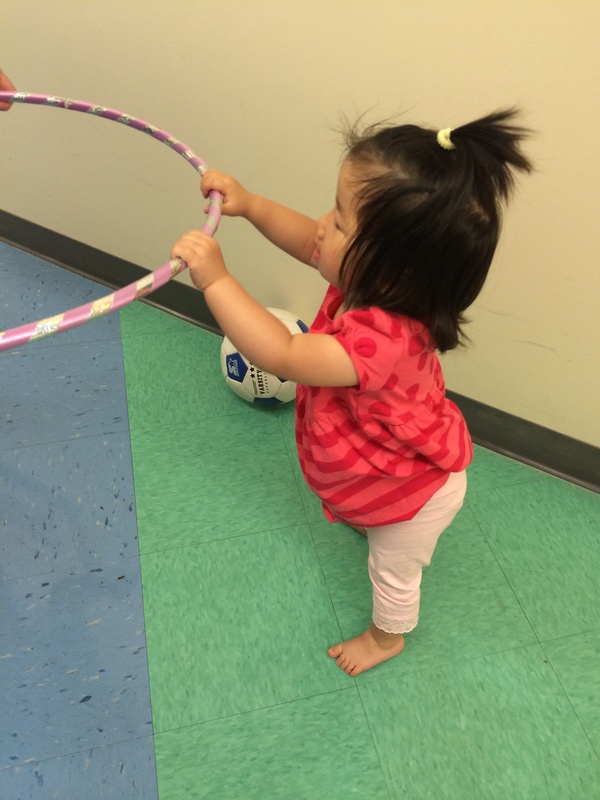 She has worked a lot with her physical therapist on learning to squat and bend down. 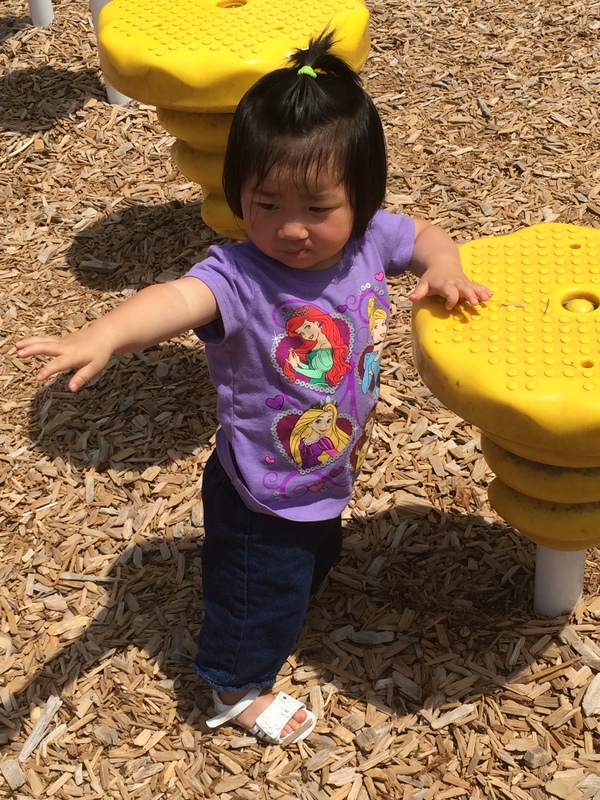 If we hold both hands to balance her she can take several steps without tripping or falling. She cannot walk when holding one hand, though, and she cannot stand up in the middle of the floor by herself or walk alone. 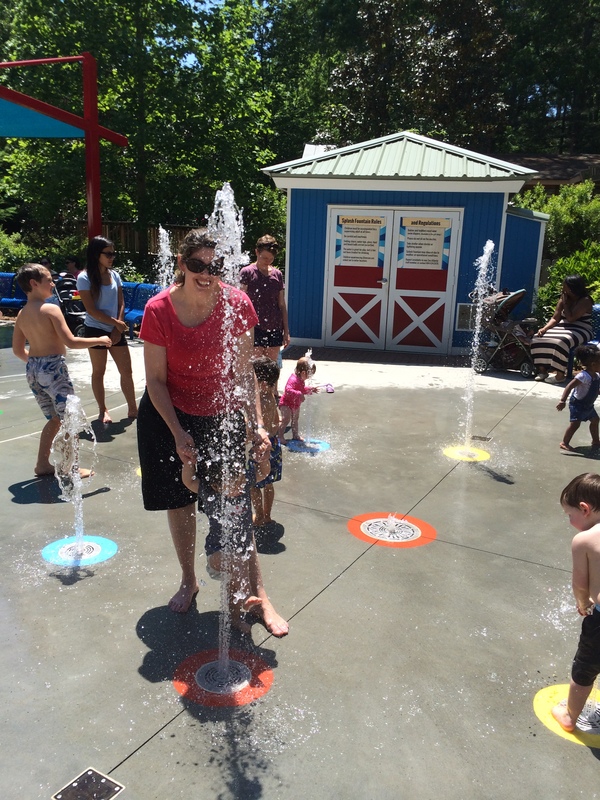 Maggie was motivated to stand on one leg at these fountains so that she could hold her other leg in the stream. In fact (and this isn’t even on the chart, probably because it is on the 9 month chart) she is starting to pull up to stand using furniture and she is beginning to creep along on furniture, especially along her crib, where she feels most comfortable. She is fearful of falling and tentative about creeping. She doesn’t do it without prompting generally. When she is standing and I try to help her “stomp” her feet up and down, it is easy to raise the right one but the left feels glued to the floor. She creeps more easily toward the right–it is very hard to get her to creep toward the left. She gets frustrated and doesn’t even want to try to move toward the left. She puts most of her weight on that side and it is hard for her to shift in order to move that leg. Fine Motor: I believe she can pick up a piece of string or ribbon with finger and thumb–we aren’t doing that often as a rule…but I think she has found the odd string or thread and picked it up if I recall. She can pick up a crumb or cheerio with tips of thumb and finger, put a small toy down without dropping it and remove her hand from the toy, pick up a cheerio with finger tip and thumb tip without resting her hand on the table…she can help turn the pages of a book, but she often doesn’t care to–she only shows occasional, emerging interest in books. Oftentimes she could take ’em or leave ’em. She sometimes throws a ball with a forward arm motion–and sometimes just drops the ball, so this is emerging. 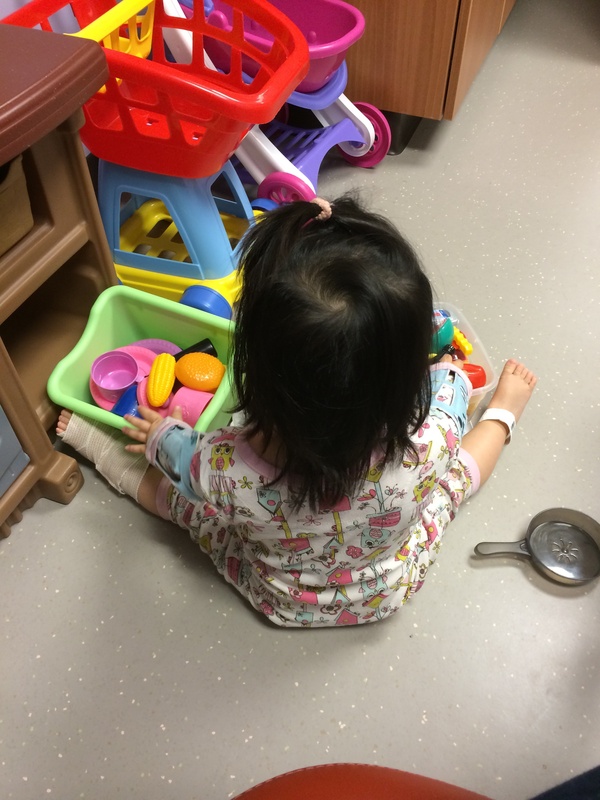 When she was tested in January she was 3 months delayed for fine motor–and when she met with the OT again in March, she was still 3 months delayed. That is actually really good, considering she is much more delayed for Gross Motor and speech than for fine motor. We are still working on learning to crawl. 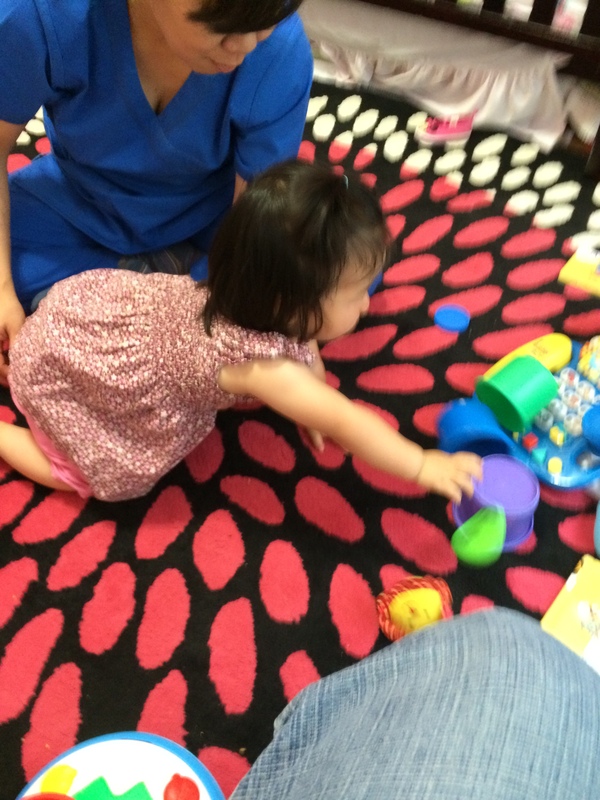 Problem Solving: While holding a small toy in each hand she claps the toys together. If I hide a small toy under a cloth she will look for it and find it. If I put a small toy into a box she will copy by putting in a toy. She can drop two small toys, one after the other, into a container like a box. In fact, when she was evaluated in January–two months ago–she could put small blocks into a mini M&M tube, which was quite good. At the adoption clinic in May. She also did her first scribble on paper with a pen on March 17 when she had her first appointment with the Occupational Therapist. Emerging skill: trying to get to a cheerio or crumb inside a clear bottle. Personal-Social: When I hold out my hand and ask for a toy she will offer it, even though sometimes she doesn’t let go. When I dress her, she pushes her arm through the sleeve once I start her arm in the hole of the sleeve. When I hold out my hand and ask for a toy she will put the toy in my hand–if she wants to. Sometimes she acts as if she will give it to me and then changes her mind and scoots away with it. She can roll or throw a ball back and forth. 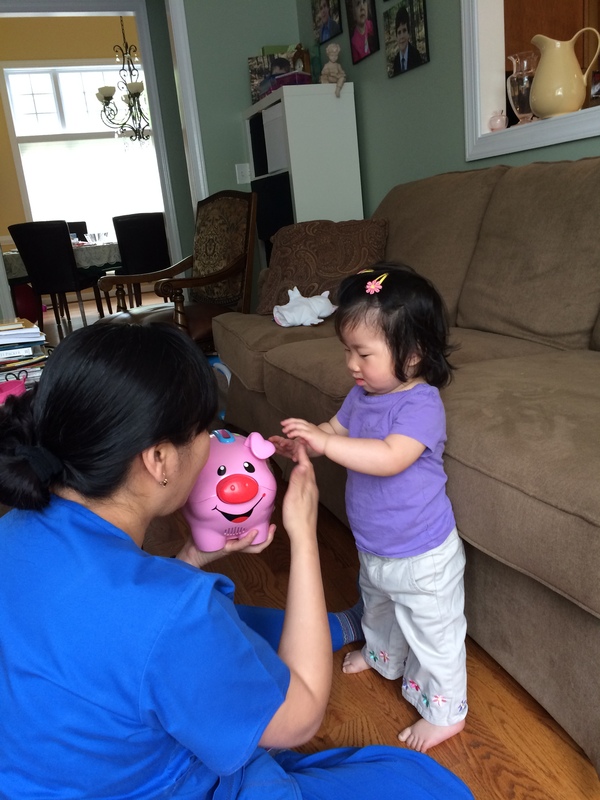 Emerging skills: She is just starting to play with a doll or hold/hug a stuffed animal. This is a new skill as of this week. Up until now she has had no tolerance for soft toys like stuffed animals and dolls. She does not yet lift her foot when I am putting on her pants, socks, or shoes, but I typically have her laying down on a changing table for this, since she doesn’t stand on her own yet, so I don’t really expect those skills yet. 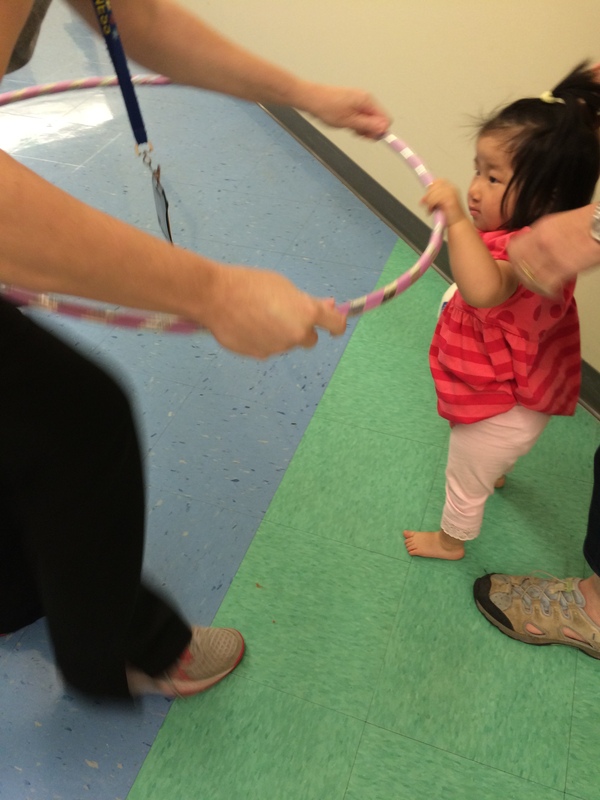 The physical therapist at the adoption clinic suggested letting her walk holding a hula hoop so she has a sense of stability but has to rely mostly on herself. She tried it once, but afterward she refused to do it again–she just lowers herself to the ground and refuses to budge. Other notes: Maggie is responding well to her therapists. She likes therapy and flirts with her therapists, trying to court their attention and approval. I feel fine about that from a bonding standpoint, as she has been home 7 months at this point and she is securely attached. Every time we have therapy she gets stronger and learns more about what her body can do. She loves to practice all her new skills again and again. She is sleeping really well, and I can lay her down wide awake at night and she goes right to sleep without any fuss and sleeps all night. The same is true at nap time. Maggie’s hair is getting so long and she has silly bed head when she wakes up. She is starting to stand up for longer periods of time to play at a low table. She can occasionally move from one stable object to another using her hands and then shifting her weight. Sometimes she gets up on her knees as if she will crawl, but still does not attempt to do actually go anywhere. She also sometimes gets up on her feet, in a “bear crawl” position–hands and feet on the floor. She doesn’t push up high enough to move this way, though her physical therapist thinks she may start bear walking instead of crawling. 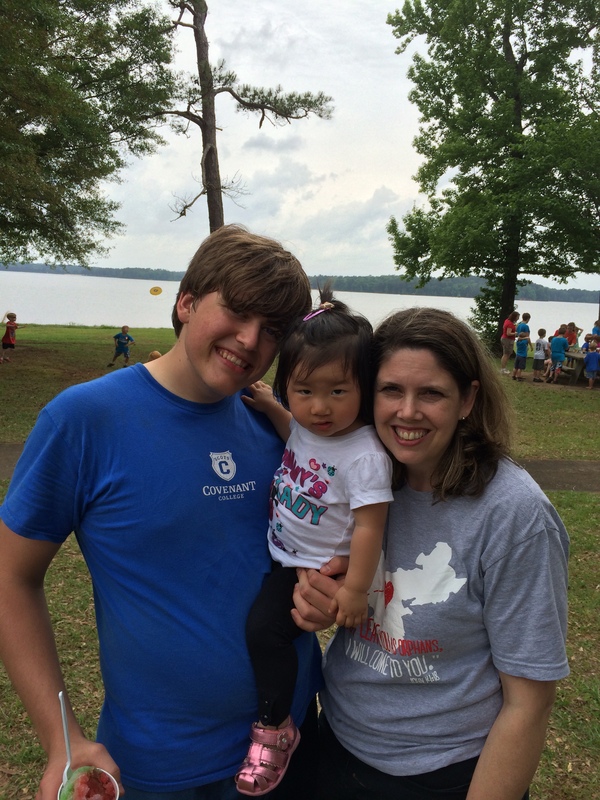 Maggie’s cleft palate will be repaired on Tuesday, May 27th at UAB in Birmingham. Her surgeon says any cleft surgeon would call this photo of her “intimidating”. Zoom in on the photo if you want a good look at just how wide her cleft palate is. We have every confidence in Dr. Ray and, more importantly, in our God, Who heals and sustains. 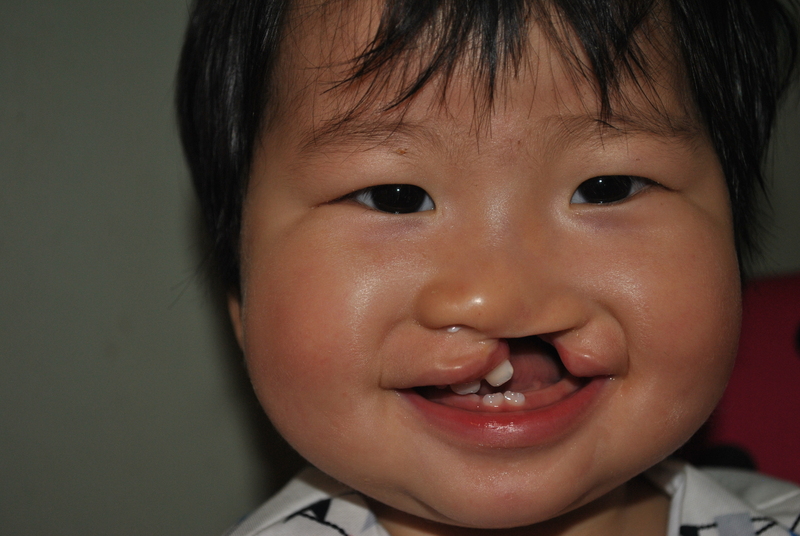 But we are also aware that Maggie’s cleft is “challenging” (again, per Dr. Ray). A wide cleft would be anything 10 cm or larger. 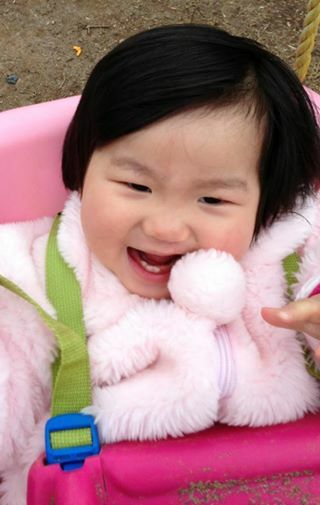 Maggie’s cleft is about 16 cm. wide. The biggest concern is that Maggie will develop a fistula (a hole in the palate that develops post-surgery). 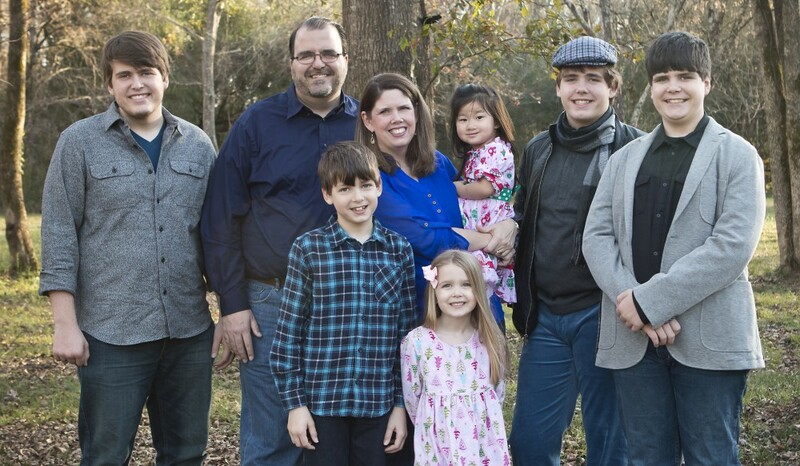 We chose Dr. Ray for many reasons, but a major factor was that his success rate is so high. We are amazed and have so much gratitude and awe for the skilled man who did such a phenomenal job on Maggie’s lip repair. Nonetheless, he wants us to be aware that she is a prime candidate for developing a fistula because her cleft is just. that. wide. Dr. Ray has several different techniques in his arsenal that he can use to close her palate. In most cases he can choose one or two of them. In Maggie’s case he will likely need to use every single skill in his toolbox to get that wide gap closed. He believes he can do it. And so do we. But it won’t be easy and we are asking you to pray for her, that God will guide the surgeon’s hands and mind and that He will ordain success and no further palate surgery for little Mags. 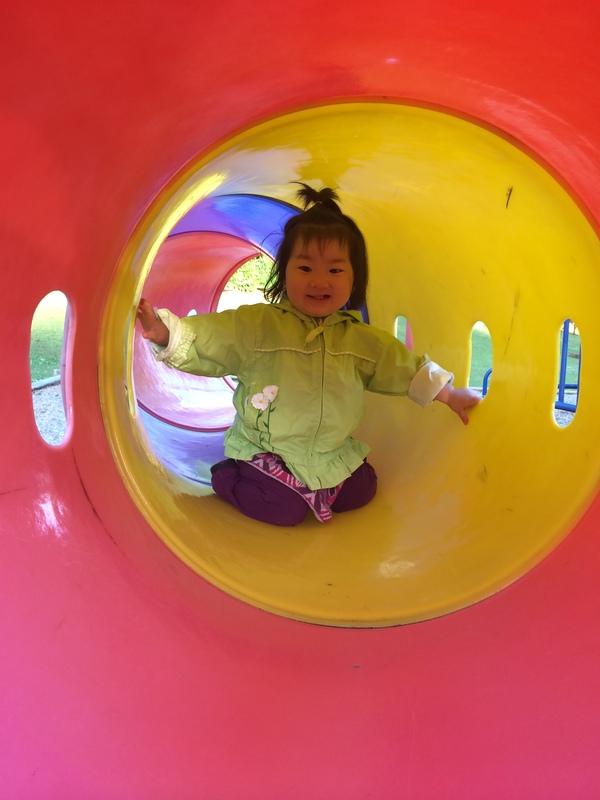 Maggie finally learned to crawl–through a tunnel at the park! I had an idea that perhaps we could teach Maggie to crawl by taking her to the tunnels at the park. And it worked! The tunnels there are too narrow for her to swing her legs around so she can’t sit up and scoot. The only way to move forward is to actually crawl. The first time I tried this we had someone at each end of the tunnel, coaxing her along. 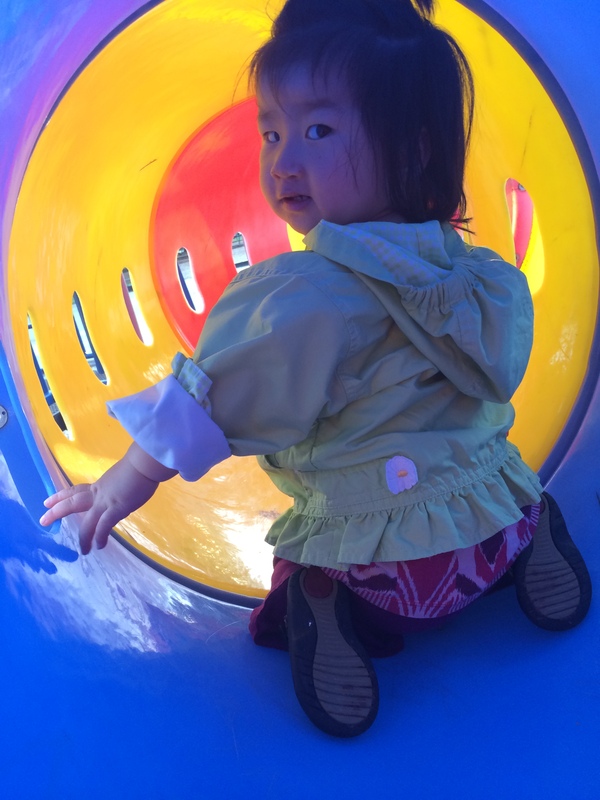 It took about 20 minutes for her to crawl the length of the tunnel the first time, on May 15th. Afterward, she was proud but exhausted. By May 19th she could crawl the length of the tunnel in about 5 minutes, and had the endurance to do it more than once. I asked her physical therapist to meet me at the park to show me some of the other things I could be doing with her there. 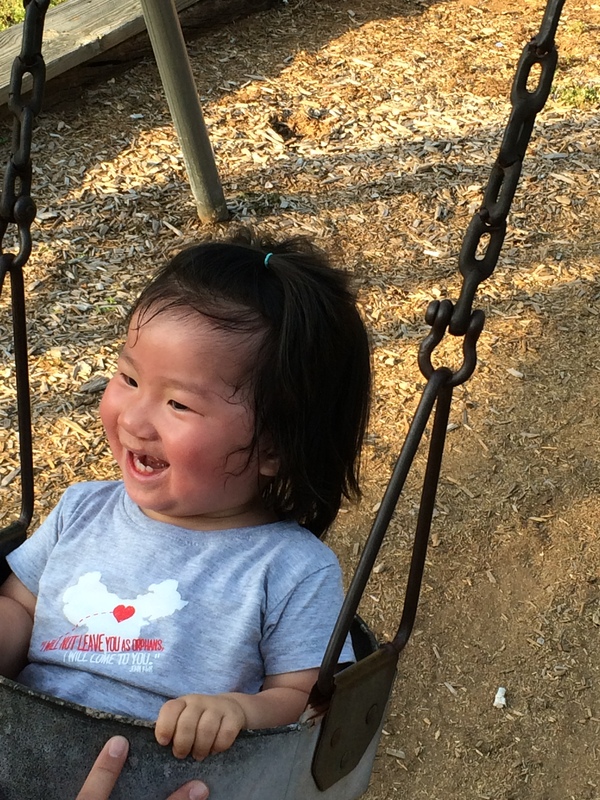 Holding herself upright in a swing is good for developing her stomach muscles. Making this bouncy chair move is also good for her abs. 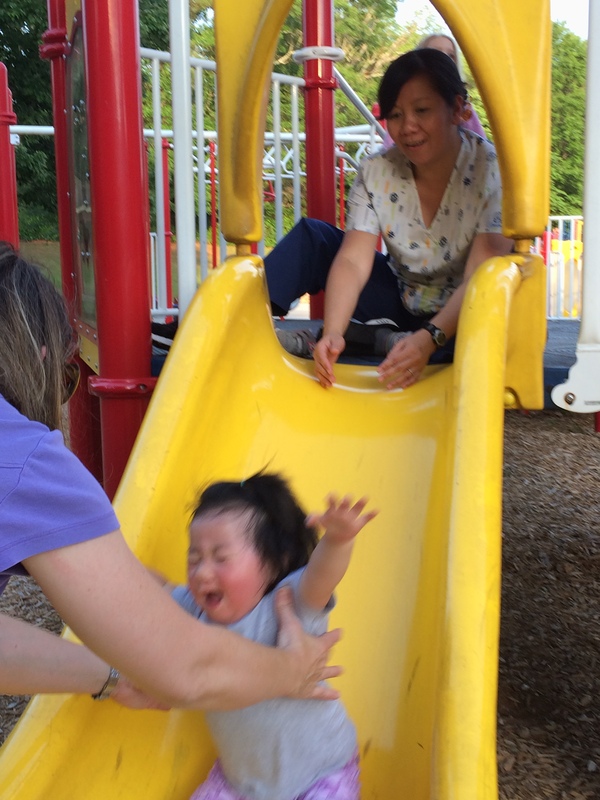 We worked a lot on climbing stairs and learning to slide. 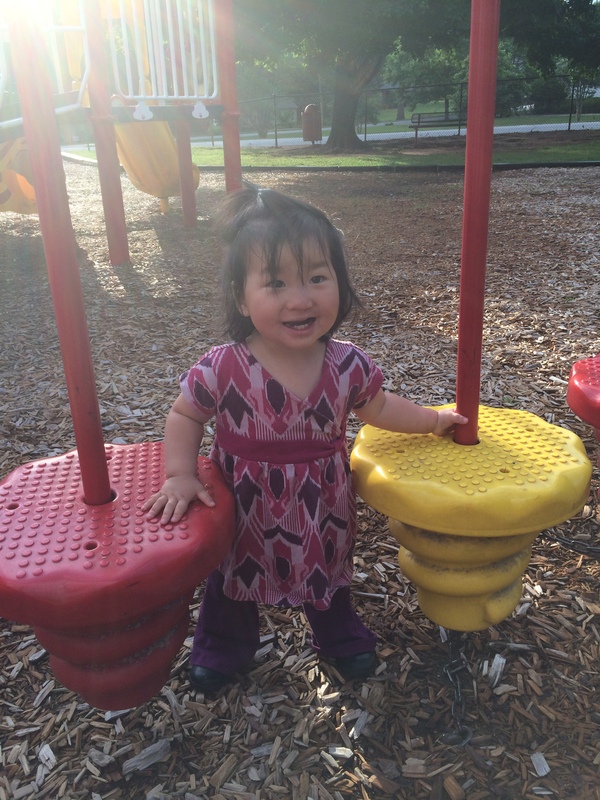 Keeping her balance with these swinging platforms is fun.